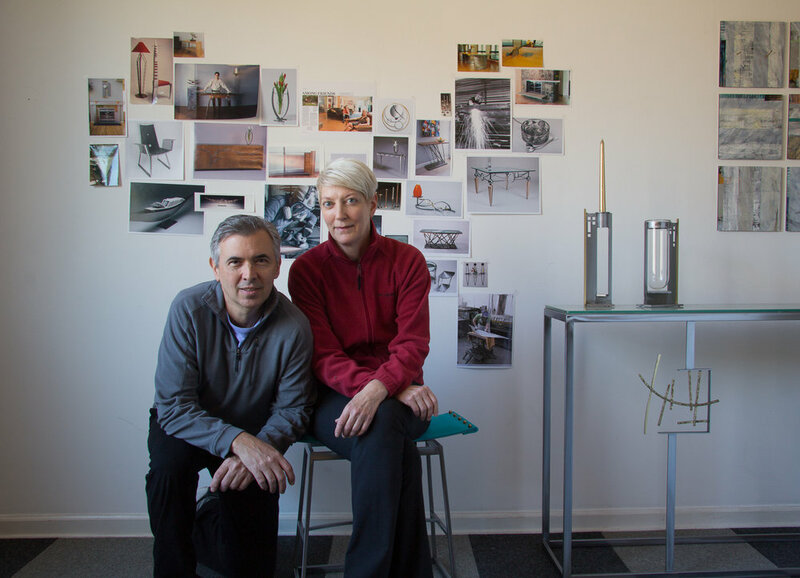 Ken and Julie in their studio with new work and photos of some 'classic' pieces and shots from the steel room! Julie and Ken Girardini are the principal designers at their small studio in rural Maryland. They specialize in designing metal objects for the home: furniture, lighting, clocks, candleholders, as well as sculpture and fine art. "We are self-taught and pride ourselves on creating each and every piece by hand. We have deliberately chosen to make a living with our hands and minds and have done so for the past 28 years. Our primary medium is cold rolled steel, but we add curiosities like glass, brass, copper, paper and wood to keep it interesting." They have participated in a number of the most prestigious juried art and craft shows in the United States, including the American Craft Council Shows, The Philadelphia Museum Craft Show, The Washington Craft Show, The Evanston Craft Show and the St. Louis Craft Fair (to name a few). Each of these juried shows receive thousands of applicants each year and every artist is invited on an annual basis. Ken is also a current board member of the American Craft Council.